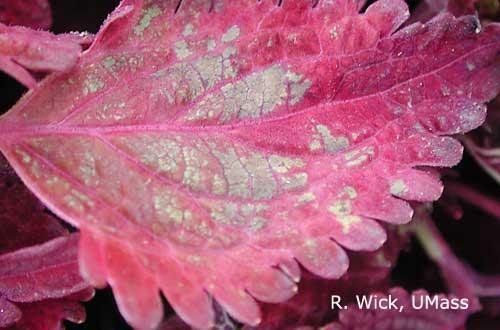 Downy mildew of coleus is caused by a species of the oomycete Peronospora. The disease was first detected in New York and Louisiana in 2005, and by the following year it could be found throughout most of the United States. It has also been reported in Japan, Germany, and the U.K. 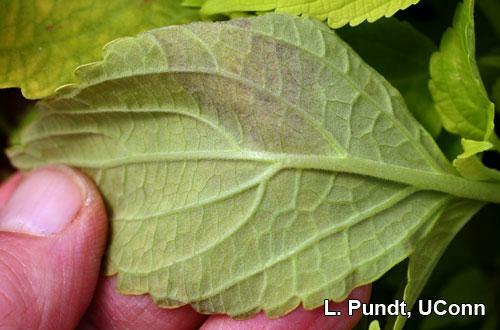 The pathogen was originally thought to be Peronospora lamii, which causes downy mildew on mint; however, genetic studies have found that it is distinctly different from P. lamii and from P. belbahrii, which causes downy mildew of basil. 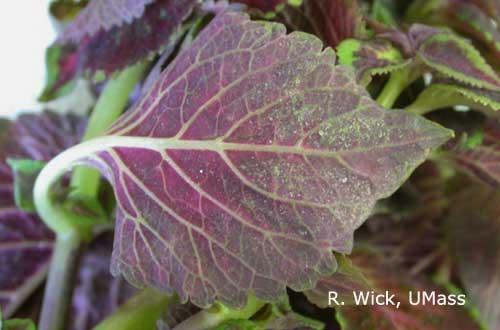 Coleus downy mildew may cause plants to be stunted. Foliar symptoms include chlorosis, angular lesions, distortion, and leaf drop. Under humid conditions, sporangia are produced on a fuzzy gray to purplish growth on leaf undersides. Lesions and sporangia can be difficult to see on dark cultivars. Lower leaves are usually the first affected. Seedlings may be stunted or killed. Cool (59-68°F), humid conditions favor infection and development of sporangia. Sporangia are carried by air currents and splashing water to other plants, where they germinate on wet leaf surfaces and infect host tissue. The cycle continues as long as environmental conditions are conducive. In warmer (>77°F), less humid environments, symptoms may not develop on infected plants, appearing only when the temperature decreases. Long term survival strategies for this species of Peronospora have yet to be elucidated. Production of oospores, the thick-walled survival structures that allow some downy mildews to persist in soil, have not been reported in coleus downy mildew. It is also uncertain if the pathogen is seed-borne. Both seed grown and vegetatively propagated coleus cultivars are susceptible to downy mildew. Agastache and perilla are also believed to be susceptible to the same Peronospora species as coleus. 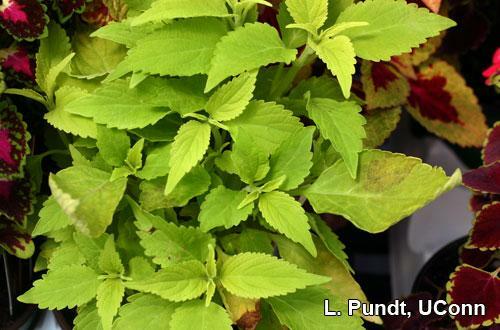 This species does not infect basil or mint, nor do the species found on these plants infect coleus. Cultural management involves excluding the pathogen from the greenhouse, proper sanitation, decreasing relative humidity, increasing air circulation, and growing less susceptible cultivars. • All new shipments should be carefully inspected before allowing plants into the greenhouse. • Toward evening, heat and vent the greenhouse, especially when warm days are followed by cool nights. • Improve horizontal air flow by the use of fans. • Run fans at night. Fans may be connected to sensors that will turn them on when the RH reaches 70% and turn them off when it drops below 65%. • Reduce humidity in the crop canopy and facilitate leaf drying by spacing plants properly. • Water in the morning, if practical, or use drip irrigation rather than overhead. • Scout regularly. Remove and discard infected leaves and plants. • Do not save stock plants from year to year. • Do not use coleus in outdoor flower beds near greenhouses. • Although there are no truly resistant cultivars, some are less susceptible to the disease than others. Studies have shown that ‘Freckles’, ‘Russet, ‘Saturn’, and ‘Pegasus’ are among the more tolerant cultivars. See http://endowment.org/wp-content/uploads/2013/03/136-ColeusDM-Cv-2014.pdf for more information.